With the recent introduction of iPhone 6 in the market, individuals who are planning to purchase a new phone are beset by questions as to whether it would be a good choice to do so. The biggest competition of the new iPhone is Samsung s5. If you are also wondering which gadget to purchase, let’s compare the capabilities of each phone and see what each one can offer you. The Samsung Galaxy S5 dimensions: 142 x 72.5 x 8.1 mm, weighing 145g. It has a 5.1 inch super AMOLED display with a screen resolution at 1920x1080 pixels, at 432 ppi. Including a 16 MP Camera with ISOCELL, LED flash, as well as HD 1080p video. The Samsung Galaxy has one distict benefit when compared to the iPhone 6, expandable memory capacity and changeable a replaceable battery. The options for storage capacity include 16GB, 32GB, with an expandable memory of up to 128 GB via micro SD. It runs on 2.5GHz Qualcomm Snapdragon 801 Quad core Krait 400, with 2GB RAM and Adreno 330 GPU, and an Adroid 4.4 Kitkat Operating System. 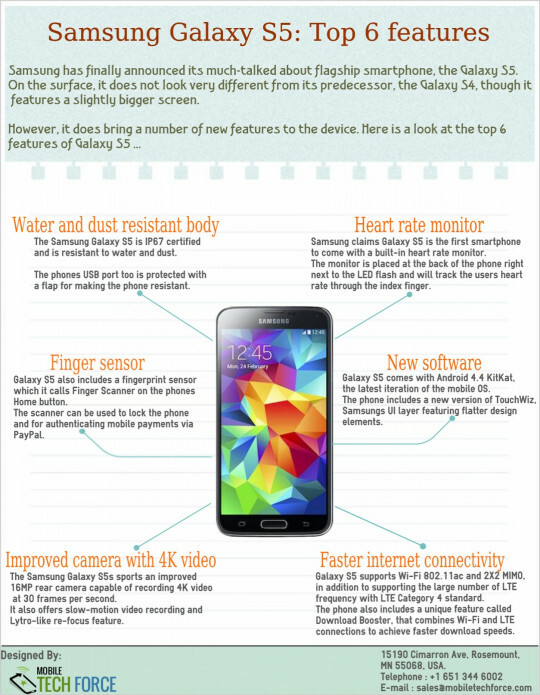 The Samsung S5 is a strong performer and currently one of Samsung's flagship smartphones. On the other hand, Apple iPhone 6 has phone dimensions at 138 x 67 x 6.9 mm, weighing 129g (16 lighter than the Samsung S5). It has a 4.7 in IPS LCD, with a screen resolution of 750x1334 pixels, at 326 ppi. Its camera comes with 8 MP iSight, LED flash, as well as 1080p video. The options for storage capacity include 16GB, 64GB, and 128GB. It runs on 1.4 GHz Apple A8 dual core CYCLONE, with 1 GB RAM, and Apple M8 motion coprocessor and iOs 8 Operating System. Phone Design In contrast to earlier talks and rumors, the Samsung S5 is not a complete leap when it comes to the design. From its predecessor (Samsung S4), the screen has only improved a little, including the body. The corners are a good combination of squarer yet rounded off shape to allow the phone to sit perfectly in your hand. The silver surround now comes with a ridged texture just like what we see in Galaxy Note 3. The back panel comes with a dimpled texture and matte finish. The camera has been updated with a new sensor feature that comes with a 16 MP setup and a 4K video capturing capability. At the same time, it has a mode called selective focus, which is similar to that of a Lytro camera which can enable you to capture an image prior to focal point selection. On the other hand, iPhone 6 takes on its rather soft approach towards imaging capabilities. It has an 8MP iSight sensor that has a f/2.2 aperture, digital stabilization, 1080p video, as well as true tone flash. Facetime has evolved into Facetime HD. The main annoying feature about the design of the new iPhone is that the camera sticks out from the back of the device.. This is not a problem if you put a case on your phone, but it might annoy you if you lie your phone on the table as it will wobble. Whether or not you will purchase a Samsung s5 or an iPhone 6, it is better to give consideration to what you really need. Do not just go for the brand; make sure that the gadget will fit your requirements. This iPhone 6 review and Samsung S5 review will guide you through the process. Looking to buy accessories for the iPhone 6 or Samsung S5? Stop here and have a look at our shop. We have a wide variety of cases and accessories available to buy online today.